Customers love a wireless alarm system for its convenience. But what if it gets hacked? Here’s what you need to know about digital security. The smart home industry is growing at a rapid pace, and it’s expected for it to grow to a $21.6 billion market by 2020. What this means is that smart home components like a wireless alarm system or security cameras become more common. All of these devices rely on an internet connection, which makes it convenient for you. However, the primary problem of a smart home is that it’s easier for people to hack into it. Sure, this system helps protect you from physical threats like burglars, but there are hackers out there that can compromise your home’s safety in a remote manner. They can compromise some things like your identity and personal information. Is Your Wireless Alarm System Prone to Hacking? The simple answer is yes. The reason behind it is that even maximum security systems have exploitable vulnerabilities hackers can use to hack in. With this, the measure of its effectiveness lies with how difficult it is for hackers to break through. A lot of low-end alarms can get compromised fast because they’re outdated and don’t have authentication and encryption capabilities. Hackers can use this weakness to suppress it or make it go off. With this system, the hacker only needs to be within 10 feet of your home to disable your alarm system. Another thing you need to watch out for when it comes to your alarm system is encryption. When your system doesn’t have a decent level of encryption, the hackers can intercept your data. Once they get access, they can trigger false alarms or create a copy of your data for their personal use. They become aware of the things happening inside your home and know when you leave. Aside from that, they will know where your sensors are and determine your unlocked doors and open windows. The worst thing that can happen is that they can watch what you’re doing with the use of your cameras. How Can You Get Hacked? Your wireless alarm system can either be WiFi- or Bluetooth-enabled. It uses wireless signals to function, and hackers can break through and tap into these with the right set of tools. If your device doesn’t encrypt these transmissions, they can hijack the system for their personal gain. Some hackers use cheap Software Defined Radios (SDRs) to intercept transmissions from alarm systems and control pads. SDRs are TV-tuner dongles you can plug into your laptops. If they capture these unencrypted signals, the hackers can direct your alarm system in any way they please. Invest in a wireless alarm system with a lot of good customer reviews. Look for a system that puts a lot of emphasis on data encryption. Any data it sends should be secure enough to prevent interception no matter what method it uses to do so. A lot of smart security devices like the wireless alarm system open their app design elements to other developers. They do it for the sake of convenience as well as various other benefits of developing better software. However, this makes it easier for hackers to understand the software and find exploits they can use for their schemes. For example, systems that enable you to open smart locks through an app have a bit of a problem when it comes to security. The reason behind it is that their makers allow third-party members to make and sell apps compatible with it. Those apps give hackers the capabilities to hack into its loopholes. The problem with security is so bad that a recent study found that more than 40% of the 500 third-party-made apps for the Samsung platform showed vulnerabilities. They can get accessed because they have design flaws that enabled unauthorized people to have access. 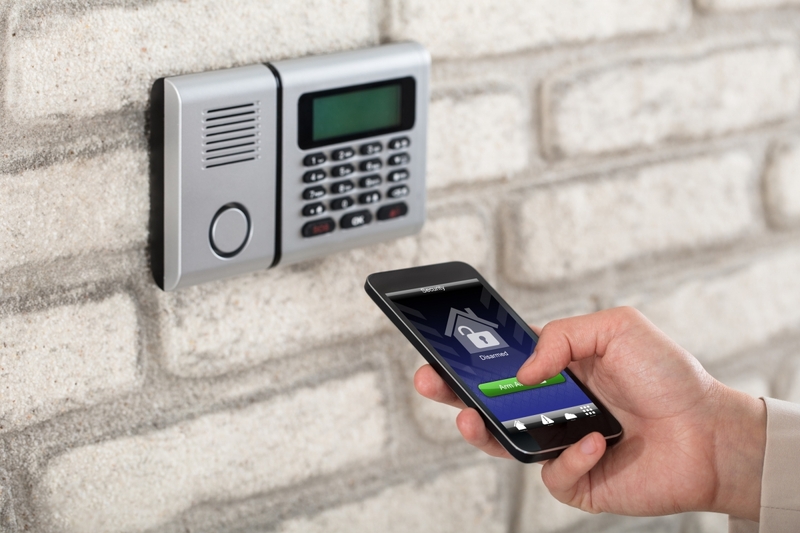 When you invest in a wireless alarm system, make sure that it’s a model that’s strict when it comes to giving third-party app access. Always ensure that your system’s software and firmware is up-to-date. The reason behind it is that it helps patch up possible loopholes that exist in previous versions. This is a weakness that most people forget. High-tech security devices that people can access and reset are often at risk. They become gateways for people to tap into your private information. Some devices have buttons that make it possible for people to access your WiFi connection. If it’s located outside your house, someone might just need to remove a few screws, tamper with it, and turn your system against you. When looking for a good wireless system (or any security device), make sure that people can’t move it without considerable effort. This is especially important when your device is outside. If you don’t feel confident about your skills to set it up, you can contact professionals to do it for you. In any case, make sure to keep its firmware updated. Doing so makes it harder for hackers to break into your home network even if they tamper with it through physical means. Learn More About Wireless Alarm System Today! Your wireless alarm system offers great convenience when it comes to securing your home. However, you need to know that it’s not fool-proof, especially if it’s outdated. Always stay vigilant and don’t be afraid to spend money to upgrade your system. The risk of getting your system compromised is not worth saving money. Some hackers can access your personal information and use it to steal your identity. The worst that can happen is your credit card information gets stolen and used to make big purchases in your name. Do you need more information about your wireless system’s insurance? Contact us today and we can help by giving you a quote.